Familiarize yourself with the Italian classics while planning your big trip! Maybe you’ve studied the literary translations in school, or you’re fluent enough to read the classics and you now you think you’ve got a pretty good handle on Italian culture. We can learn, study, teach, and memorize until we are experts on a given subject, but if we’ve never fully immersed ourselves, tangibly experienced, or gained first-hand knowledge are we really experts? Across the world, immersion schools are becoming highly regarded language-learning environments because they force students to problem solve with a vocabulary completely unfamiliar to them. As a student of one of the most widespread romance languages, shouldn’t you give yourself an opportunity to truly experience the culture you study so vehemently? If the answer is yes, AESU will help you travel Europe cheap and prepare you with a blog this week on ‘the three jewels’ of Italian authors. Let’s immerse ourselves, shall we? One of the three Italian authors referred to as ‘the three jewels,’ he is the considered the father of the Italian language. During a very ancient time where Latin was the written language of choice, Alighieri dared to compose his words in Italian. With his most famous book of rhymes, “Divine Comedy” One of the masterpieces of world literature and the first book written in Italian, the epic poem explores an interesting representation of the afterlife that speaks to medieval world perspective as it developed in western churches. If you’re a daring student, try giving it a read in the native tongue. It could open a whole other world to you that will help you prepare for a whole new world this summer! Another classic, forerunner of the Italian language, Petrarch is known as the father of humanism. The second writer of ‘the three jewels,’ this man was a true poet. Ever heard of the Petrarchan sonnet? That’s this guy! His words became the model for lyrical poetry throughout Italy. The words he wrote were used to create a model for Italian as a written language. The third and final jewel of the Italian language, Giovanni Boccaccio is famous for being a realist. With dialogues and stories written to illustrate the complexities of the real world, he is most famous for his work, Decameron and On Famous Women. 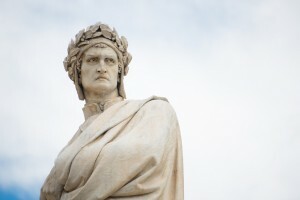 An extremely popular author, for his time, Writing in mostly Italian, and sometimes Latin, Boccaccio also helped shape Italian as a written language. AESU offers several trips to Italy, including: Cosmopolitan, Explorer, Euro Focus, Great Escape, Viva Italia, and Euro Spree. Explore Italy and its ancient architecture, plus see the historical legacies of Dante, Petrarch and Boccaccio themselves! If you have any questions or want help booking your Italian adventure, please contact AESU by calling 800-638-7640, or fill out the contact form found on our website! This entry was posted on Wednesday, June 8th, 2016	at 11:13 am	. You can follow any responses to this entry through the RSS 2.0	feed. Both comments and pings are currently closed.